Gemstone and Cubic Zirconia. Diamond Jewelry. Fine Silver Jewelry. This Certificate of Appraisal is done by an expert jeweler with over 25 years of experience. Diamond/Jewelry grading takes into consideration many things including color, quality, cut, etc. The Solitaire 6X8mm 1.24ct Tanzanite Oval stone is set in a four prong setting. Around the dramatic blue oval center are 2mm white diamonds 0.50ctw on a eight point star pattern. Then each 2mm diamond is encircled by three 1mm diamonds, all defined with gold. Total Natural Morganite Weight is -. Total Round Diamonds Carat Weight is -. RING WEIGHT IS 4.0g. RING SIZE: 6 (FREE SIZING AVAILABLE). Item: Sapphire Diamond Ring Gemstones: Sapphires (natural, marquise and baguette cut); Diamonds (natural, single cut) Approx. Item: Sapphire Diamond Ring. Stamping or Factory Markings: 14K FPH. Size or length: Size 8.5 (ring sits between 8.5 and 8.75 on mandrel); band is 2.4mm wide; 14mm wide at design. 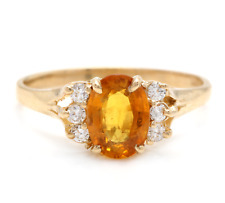 1.65 Carats Exquisite Natural Orange Sapphire and Diamond 14K Solid Yellow Gold Ring. Total Natural Yellow Sapphire Weights: Approx. 1.50 Carats. 8.00 x 5.80mm. Ring size: 7.25 (free re-sizing available). Item Description: Set with a 1.66ct Natural NO HEAT Pink Sapphire and a signed Designer piece. Well made HALO Ring and comes with a signed CERTIFIED Lab REPORT. VERY NICE and .50ct in SI H Diamonds all around and on the sides. 2.16cts total. NICE piece. Stone: Natural NO HEAT Pink Sapphire and Diamonds Metal: 10k Yellow Gold Ring Size: 7 Gram Weight: 2 Grams . Item Substyle: Solitaire. Mainstone: Turquoise. Material: 14K Yellow Gold. Stone Weight: 1.5 Carat. Total All Stones Weight: 1.5 Carat. Item Style: Promise. Item Type: Ring. Ring Size: 7. It is said to carry an energy that can warm the soul of its wearer. It is best used for opening the heart chakra and it is often used to help cleanse the body of stress and anxiety. All beryl gems, including pink morganite, represent purity and potential. 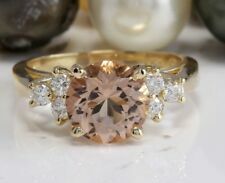 Total Natural Morganite Weight is: Approx. 1.50 Carats. This ring is in perfect condition and looks like new. Ring size: 7 (free sizing available). Ring total weight: 2.1 grams. Just let us know before checkout. Type: Natural Diamond 1.10mm G VS 0.036ct 6pcs. Type: Natural Sapphire. Weight/Size: 1.50 Carat. 7.0 x 5.7mm Approx. Our prices are affordable and most competitive. Jewelry: Ring. Size: 7 US Ring Reszie Service. Total Natural Ruby Weight is - 1.00 Carat. Total Diamonds Carat Weight is -. 65 ct. RING WEIGHT IS 12.4 gram. RING SIZE: 10 (FREE SIZING AVAILABLE). Total Natural Evergreen Topaz Weight is - 1.50 Carat. RING WEIGHT IS 4.8g. RING SIZE: 6.25 (FREE SIZING AVAILABLE). It is in excellent condition. 14K gold Blue Tanzanite and Diamond ring - small Size 7 (sizeable). The Solitaire 6X8mm 1.24ct Tanzanite Oval stone is set in a four prong setting. Around the dramatic blue oval center are 2mm white diamonds 0.50ctw on a eight point star pattern. Item Substyle: Solitaire. Mainstone: Topaz. Material: 14K Yellow Gold. Stone Weight: 1.5 Carat. Total All Stones Weight: 1.5 Carat. Item Style: Promise. Item Type: Ring. Ring Size: 7. Total Natural Madeira Citrine Weight is - 1.51 Carat. Round Diamonds Carat Weight is -. 06 Carat. RING WEIGHT IS 3.4g. RING SIZE: 6.25 (FREE SIZING AVAILABLE). These NATURAL and GENUINE gemstones are nicely matched and GOOD QUALITY. The sapphire has deep dark blue color and the diamonds are white and bright. This good size ring weighs four grams total, it sits 15mm (a little under 5/8") wide on the finger (from the hand to the knuckle), and it is sure to turn heads everywhere it goes! Mainstone: Peridot. Item Substyle: Solitaire. Material: 14K Yellow Gold. Stone Weight: 1.5 Carat. Total All Stones Weight: 1.5 Carat. Item Style: Promise. Item Type: Ring. Ring Size: 7. Accented with sparkling diamonds, a stunning 14k solid yellow gold ring, featuring a AAA graded Tanzanite solitaire, with amazing deep blues, with hints of pink, with incredible clarity. Just Gorgeous! Main Stone: Sapphire. Sapphire 1 Round 1.21 Blue Prong. Secondary Stone: Diamond. Total Diamond Carat Weight: 0.5. Stone Count Shape Carat Color Clarity Setting. Diamond 19 Round 0.5 J-K I2-I3 Prong. Main Stone: Sapphire. Ring Size: Size 7. Total Carat Weight: 1.56. Size 8 1.50ct AA Tanzanite 10K Yellow Gold Ring. one 6.5x8.5mm Oval (1.50cts) of beautiful AA Graded Tanzanite. Tanzanite is thought to inspire compassion and to encourage calmness. It is also believed to be helpful in facilitating communication and solving problems. Pictures are magnified 50x to show detail and are not visible to the naked eye. The color has outstanding glow and highly collectible on the gemstone market. This amazing high quality stone is set in a well made belcher style solid 10kt Yellow Gold 8-prong detailed setting. BAGUETTE DIAMOND ACCENTS TOTALING APPROX. 25 CT TW CTTW. 14K YELLOW GOLD RING. DIAMONDS ARE G-H COLOR AND I1 - SI2 CLARITY. SIZE 7.25 (INQUIRE ABOUT SIZING IF NEEDED). Natural Stones: Natural Mined, Not. Total Carat Weight is 1.60ct. | Main Stone: Ruby | Main Stone Shape: Round Cut. Main Stone: 2.7 - 2.9mm Ruby. Ring Size: 6.25 (Sizable) | Total Weight: 7 Grams | Natural, Not Enhanced. Mainstone: London Blue Topaz. Item Substyle: Solitaire. Material: 14K Yellow Gold. Stone Weight: 1.5 Carat. Total All Stones Weight: 1.5 Carat. Item Style: Promise. Item Type: Ring. Ring Size: 7. (2) Natural Genuine Diamonds - Trillion Cut - Bezel Set - H Color - VS2 Clarity - 0.18ctw (approx.). Quality sapphire & diamond solitaire ring crafted in 18K solid yellow gold. Stone(s):(1) Natural Genuine Sapphire - See Certification Details Below . This ring is solid 10k yellow gold. The gold and gemstone weight is 2.4 grams. The ring is stamped 10k. It is a size 6 and is sizable.U.S. This is real gold and a natural gemstone. Nothing is filled, plated, or lab created. Secondary Stone: Diamond. Total Diamond Carat Weight: 1.07. Stone Count Shape Carat Color Clarity Setting. Diamond 6 Baguette 0.42 H-I VS2-SI1 Invisible. Diamond 16 Round 0.65 J-K Si1-SI2 Prong. The intense deep bluish violet oval brilliant cut natural D’Block Tanzanite has VS clarity with no visible inclusions. This vibrant and deep color is most prized in the gemstone industry and you will catch yourself staring at this mystical color changing gemstone for hours. This ring is 14k yellow gold. It has a total of 1.70ctw of marquise and round Blue Topaz. The gold and gemstone weight is 3.9 grams. The ring is stamped 14k. It is a size 7 and is sizable. This is real gold with natural gemstones. Mainstone: Garnet. Item Substyle: Solitaire. Material: 14K Yellow Gold. Stone Weight: 1.5 Carat. Total All Stones Weight: 1.5 Carat. Item Style: Promise. Item Type: Ring. Ring Size: 7. Stone Color: Violet. Item Substyle: Solitaire. Material: 14K Yellow Gold. Stone Weight: 1.5 Carat. Total All Stones Weight: 1.5 Carat. Item Style: Promise. Item Type: Ring. Ring Size: 7. Mainstone: Tourmaline. Item Substyle: Solitaire. Material: 14K Yellow Gold. Stone Weight: 1.62 Carat. Total All Stones Weight: 1.62 Carat. Item Style: Promise. Item Type: Ring. Ring Size: 7. White Zircon from Cambodia,Claw (Prong) set, Round, 2.00mm x 2.00mm (10) 0.51. AAA Tanzanite from Tanzania, Claw (Prong) set, Oval, 6.50mm x 6.50mm (1) 1.22cts. 10k Solid Yellow Gold, 2.06g. Genuine Natural Earth-Mined Gemstones. 1.50 Carats Natural Very Nice Looking Tanzanite and Diamond 14K Solid Yellow Gold Ring. Total Natural Pear Cut Tanzanite Weight is: Approx. 1.10 Carats. Natural Round Diamonds Weight: Approx. 0.40 Carats (color G-H / Clarity SI1-SI2). (14kt Yellow Gold Diamonds Ruby Ring. Style:Diamond Ruby Ring. Ruby:Natural(Heated). Cut:Heart (6x6mm). Ring Size:6.5. Gold Weight (grams):2.32g. 1) Ring Resizing. 2) Ring Redesign. Total Natural Evergreen Topaz Weight is - 1.60 Carat. Round Diamond Carat Weight is -. 03 Carat. RING WEIGHT IS 2.8g. RING SIZE: 6 (FREE SIZING AVAILABLE).